Monetary policy in Israel has gone through major changes in recent years where the inflation escalated to triple digits. Therefore Israel established a stabilization program which started after June 1985 depending on a policy that has been trying to sustain a fixed but adjustable nominal exchange rate, which was considered a key nominal anchor in the fight against inflation. 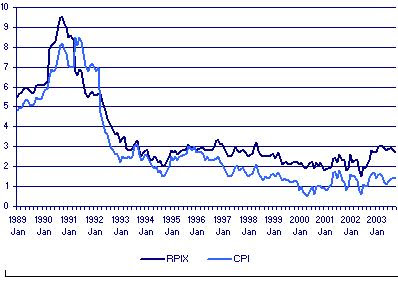 Throughout this first phase, from 1986 to 1991, inflation stayed in the range of 16–20% as a yearly average. The second phase, from 1992 to 1996, they have changed the exchange rate policy by depending on a crawling exchange rate band and by adapting an explicit inflation target. Disinflation in Israel has been a relatively slow process. It took more than a decade for the rate of inflation to fall from about 18 percent per year in the late 1980s to less than 4% per year in the late 1990s. For the years 2000 and 2001 the government has set an inflation target range of 3-4%. When we look at the following figure that depicts the comparison between the actual and the targeted inflation rates, we see that Israel can be said to be successful in decreasing the inflation. In 1970s, the economy has been stagflated and the monetary policy was very weak. 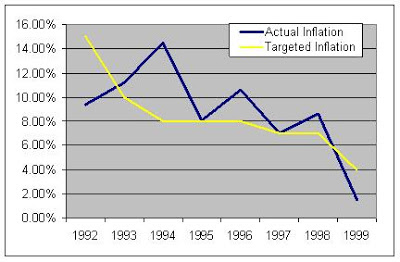 In 1992 the development of Inflation Targeting started. After the country started to target inflation in 1992, inflation has been very low in the United Kingdom. 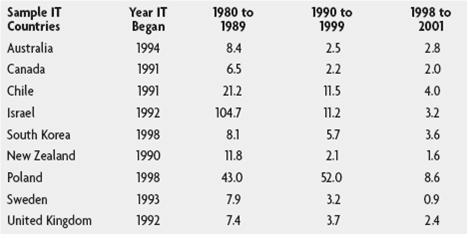 This table below denotes that inflation (using the former RPIX measure) has been steady since 1992.